True armyworm have been found in a few fields this weekend. Cereals, corn (especially, though not exclusive those fields planted into rye) and mixed forages are at risk and should be scouted every three or four days over the next three weeks. True armyworm identification was covered in a previous blog this spring (here). 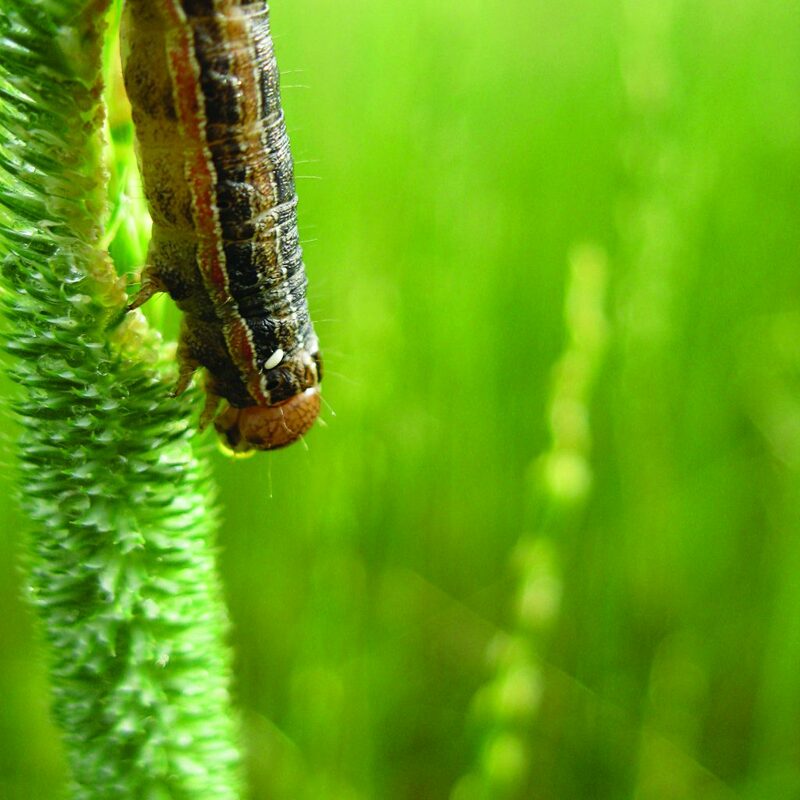 Scouting Guidelines: The best time to scout for true armyworm is shortly after dusk when larvae are actively feeding. In corn, examine 20 plants in five areas in the field (100 plants total). 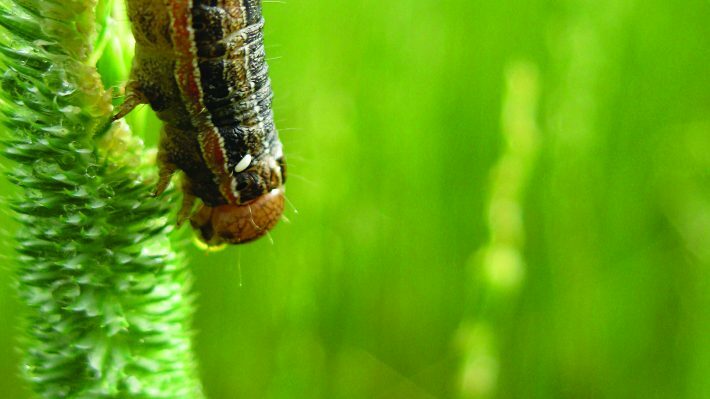 In cereals and mixed forages, examine 10 areas of the field, assessing the number of larvae per 30 cm x 30 cm (1 ft2). Pay particular attention to the border area directly adjacent to other grassy host crops. During the day, if it is cloudy and overcast, you might be lucky enough to see larvae in the whorl, leaf axil, or on the head of the plant but on sunny days, they will be down on the ground among the crop debris or under soil clods. Brown frass may also be present on the plants and on the soil surface. Always take the time to look for any white eggs that may be attached to the backs of the armyworm larvae. This is a sign that the larvae have been parasitized by one of its parasites which have done the job for you. Avoid treating with insecticides when large numbers of parasitized larvae are present. Threshold for Corn: Foliar insecticide may be warranted in seedling corn if there are two or more un-parasitized larvae per seedling or 10% or more of the plants have feeding and larvae are smaller than 2.5 cm (1 in.). For corn past the 6-leaf stage; if 50% of the plants have leaf feeding damage and are infested with larvae smaller than 2.5 cm (1 in. ), insecticide treatment may be warranted. As long as the growing point of the plant is not damaged, the corn plant is usually able to recover from moderate feeding. 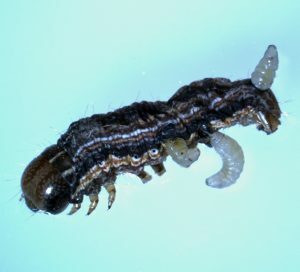 Threshold for Mixed Forages: Control is warranted when five or more larvae (smaller than 2.5 cm) per square foot are found. In seedling crops, two to three larvae (smaller than 2.5 cm) per square foot may warrant control. Avoid treating with insecticides when large numbers of parasitized larvae are present. If the larvae are over 2.5 cm (1 in.) long, the insecticides will not provide adequate control. 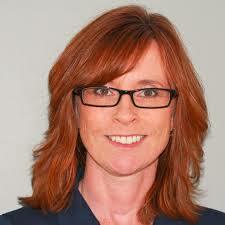 Treatment may be confined to infested areas. If armyworm are migrating from adjacent cereal, mixed forages or corn fields, spraying an insecticide along the field border may be sufficient.